This weekend- Saturday, September the 15th and Sunday the 16th, we are open extra hours for the Longfellow League of Artists art crawl. Come see original (and reasonably priced! 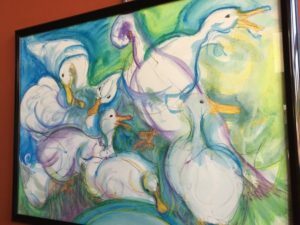 )paintings by local painter Laura Burlis, beautiful jewelry and purses by Catalina Bauer Zucabau and newly framed linoleum block prints by Anita White. They are all worth seeing on their own, and together, they are a must-see stop on the LoLA crawl. All other hours remain the same. See you there!